What a whirlwind. We’ve been in November for 9 days. And it’s been nuts. Let’s just look at this empirically, shall we? With the start of November, first there was the take down of Halloween. Halloween has just gotten too spooky. Seriously people, enough already with the blood and goo and violent paraphernalia. We are not the real life Walking Dead and I do imagine if a live zombie came lumbering and grumbling your way, you might poop yourself and run (it’s always a good time for an oxymoron or two). So what’s with the increasingly growing gore of Halloween? Growing up, my mom and I would visit local craft shops set up in parking lots and fields and ogle at all the cute pumpkin, scarecrow, turkey, and charming broomsticky things representing the start of the autumn season. Somehow, that innocence seems to have been forgotten. Nowadays, we’ve gone straight from this growing grossness of a spooky, dead-loving holiday to – wait for it – Christmas? It was August 30th when I saw my first sign of Christmas. Rob and I were in Costco and they had just displayed their wrapping ribbon. We stopped, looked at the ribbon, looked at each other, and with a slight head shake (and most possible eye roll), kept walking. The day before Halloween, we saw our first Christmas commercial. However after discussing it (yes, we discuss these things), we decided it didn’t officially count because the real commercial showing Christmas is upon us is the one with the Hershey Kisses bells ringing “We Wish You a Merry Christmas.” Yes, I am coining that as the official sign of Christmas – Hershey’s Chocolate, you’re welcome. Anywho, despite my love, adoration, borderline slight obsession with Christmas (our house blows up into a reindeer, elk, and moose bedazzled wonderland), it’s frankly not yet time. While the commercial world tries to build up this monstrosity of constant technology, and gimme, gimme, gimme attitudes, and desensitizes children from the innocence of these holidays – clearly, the teacher in me has a bone to pick – I am determined to not let November fly by in a disingenuous prelude to Christmas. Also, in between good riddance-ing Halloween, avoiding a premature Christmas celebration, and fitting in the best historical foodie celebration our nation celebrates, there was probably one of the most stressful, surprising, amazing, horrible, and memorable elections our nation has probably ever seen. Over the last few years, our national hard drive has been doused with water, sparking shards of entitlement and division and teaching blame-to-everyone-else-rather-than-accountability across our land. So this morning, after turning off the tv around 1:45am and then still staying up way too late with anxiety and anticipation, I roused myself to full awareness around 4am to a historical headline. And despite anyone’s political affiliation, I think most can agree that this election pushed the giant reset button on that national hard drive (and finally those horrible commercials can stop). So, taking slow steps through this significant day, I mindfully look at my little home adorned with the peaceful signs of the season: pumpkins made from old draperies found in a southern mountain store in NC, red maple leaf placemats, and my personal favorite, antique 14-carat gold rimmed, hand-painted dessert plates adorned with turkeys, pheasants, and mallards. They are all now in their showcased place, ready for their 43,830 minutes of fame (that’s total minutes in November, and math is cool). By golly, all of this calls for a damn good dish. While we are just starting to wake up to a morning chill here in North Florida, I feel the need to plunge head first into everything autumnal, even if it means I need to turn my air conditioning down to a sweater-wearing degree. It’s also the season for entertaining, and my mind is racing with great ideas for great food with great people – no matter what the celebration. 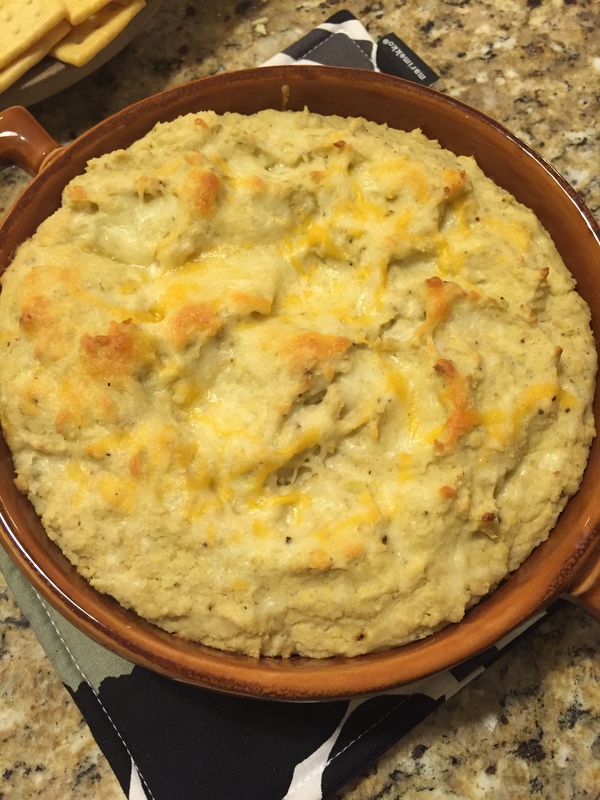 Like this Artichoke White Bean Dip. It’s simple, it’s easy and it is oh-so-good. Hardly an indulgence, it’s not as dairy-filled as many artichoke dips tend to be. Being dip-worthy, spread-worthy, put-on-a-sandwich-or-mix-with-tuna-fish-worthy, this has become a new standard for easy, crowd-pleasing recipes. So in between tonight’s news reports claiming disbelief at what just politically happened, and the constant Pier 1 Christmas commercials, make this dip and serve it to a friend or two (with a cocktail, of course). Its warmth and depth will comfort you with Autumn, helping bring the season back to the heart of what it is meant to be. In a food processor, mix all above ingredients except for the olive oil. Make sure everything is well incorporated and taste for seasoning. When mixed, pour into an oven-proof baking dish (a ceramic pie dish works well). Drizzle with a bit of olive oil (and cheese, if using), and put in oven until the top is browned and the mixture is hot throughout. Serve with crudités, bread, pitas, crackers, or simply a spoon (save the spoon for home-alone times, not so much entertaining). I’ve moved a lot, both growing up and now in my adult years. More than occasionally I get the, “How do you do that?” round of questioning, mostly from people that consider a significant move an over-filled pick-up truck unloading across town. Now, don’t get me wrong, a move is a move. But some are more uprooting then others. We’ve been in Jacksonville for about 3 years now, and I’m starting to get a tad bit antsy about where we’ll go next. At night, Rob and I lie in bed perusing Zillow, dreaming of a possible destination for our next Coast Guard-led adventure. Port Angeles, Detroit, Boston, not much is out of the running except for land locked areas, most of which we wouldn’t want to live in anyway (sorry, Oklahoma. Been there, done that). Of course we look at houses that are waaaaay beyond our means – with kitchens that just might make me famous – but it’s just a fun torturous game we play. Like window shopping at Gucci. Everywhere we go we try to squeeze everything we can out of the location, and we have only a year left in north Florida. We’ve done a lot here, but definitely have a lot more to go, do, and see. Though altogether we’ve found things we love (paddle boarding, the bird life, dolphins, good shopping), and really don’t love (the bugs, the heat, the bugs, the heat, oh and snakes. Well, I don’t mind the snakes, but Rob runs away like a little girl). In terms of one of the more important things in life – food – we’ve also found our regional likes and dislikes. Sorry, Southern folk, we haven’t taken to the oddly-hairy-yet-slimy-at-the-same-time-omg-who-created-this-thing called okra, nor have some traditions (potato salad at Thanksgiving?) found a settled place in our hearts. BBQ, however, that’s a love story. So are the sweet onions. Also, honey. And so are the beets. I’ve never actually documented the epic argument Rob and I had over beets. Maybe one day. But, beets! Really? Aren’t there better things to argue about, like sponges or spoons? Well, we’ve grown in our relationship since arguing about beets (thank goodness) and now we can’t go a week without them. Luckily, farms in Florida grow beets almost year round, and the months they don’t, the red roots keep for a long while in a crisper – if they last that long. Thankfully, our CSA provides us with bunches regularly. We eat them straight from the oven, or cold with a bit of vinegar and honey. I’ve chopped them up into fancy tapenades and relishes, used their juice to dye Easter eggs, and have even infused vodka to make a fancy beet cocktail. Beet options are endless. So then why are restaurants only serving beets with the standard goat cheese and arugula? I mean, some have pecans, some do a balsamic reduction drizzle, but really they are all the same. It’s so sad! Culinary monotony at its best. So let’s turn the tables, shall we, and shake up the beet world. Vegetarians, unite! Meat Eaters, indulge! Paleo folk, take a shower from your last CrossFit workout and pick up one of these tacos (sans cheese and crema)! These are simple enough for a weeknight, but impressive enough for easy entertaining. 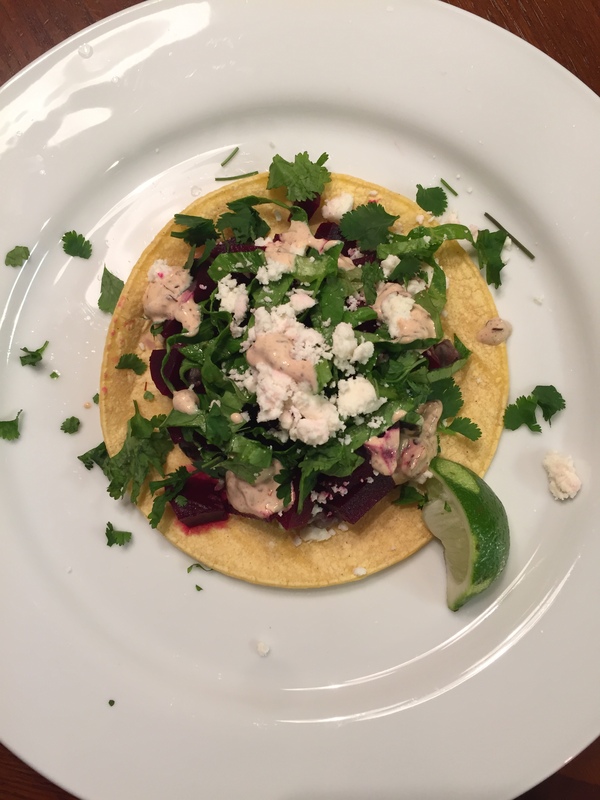 Having spent enough time in Mesa, Arizona, I prefer the small corn tacos to flour, and I feel their earthy flavor compliments the sweet beets wonderfully. 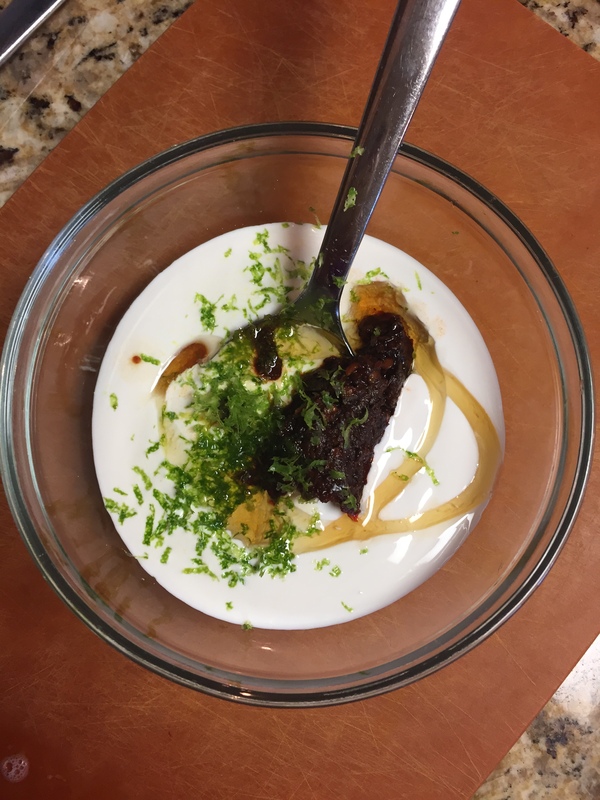 Chipotle crema is nothing more than 1 c Mexican cream (found now at most grocery stores), 3 chopped up chipotle peppers, lime zest and 1 tsp of agave. Every Mex dish needs some beans, which are super simple to prepare. Heat some canned black beans (drained and rinsed) in a pot over medium heat with ½ c water, 1 glove of garlic, and a sprig of mint. Once boiling, remove from the heat, discard the herb and garlic, season the beans with s&p, and smash them with a fork. For the star of the show: In a foil-lined baking dish, roast 4 peeled beets at 400 degrees with a dash of s&p, a drizzle of canola oil, 1 tsp cumin, and a whole jalapeno (sliced down the middle) until beets are tender, about an hour and a half. The fresh topping of crisp cilantro (tear off stem) and soft shredded romaine (roll 2-4 leaves like a cigar then chop into thin strips) top off the bite with herby freshness. For an optional creamy, salty indulgence, crumbled Queso Fresco tops the taco with ease. Oh, and don’t forget the squeeze of that lime you zested earlier (it’s not just a margarita garnish, you know). When Rob and I were dating, tacos were our go-to dinner date. Here in Jacksonville, we haven’t been able to find quite the same ole(!) experience as I we had in the South West. Remembering those fresh flavors, I decided to create my own using one of Jacksonville’s finest produce, the bodacious beet. Yes, bodacious. With Cinco De Mayo coming up, enjoy these tacos with friends and maybe a marg or two. You’ll get the best of two worlds, or at least the best of two regions of the U.S. (speaking from lots of moving – and eating – experience here, folks). Put the corn tortilla on a plate. Spread some of the smashed black beans on the tortilla. Top the beans with some roughly chopped beets. Then Top the beets with the lettuce, cilantro, queso fresco, and a drizzle or two of the crema. Squeeze the juice of a lime slice over the top, and you’ve got seriously one of the best tacos you’ll ever eat. If you like beets, check out these and these. No, my life wasn’t literally in danger. No, there weren’t superhero galettes flying around donning colorful capes and swords. Nor were there any galettes with magical powers. I simply had a stressful day, and this galette made things better (apparently I’m a little dramatic). Here’s what the galette did do. For one, the crispy, crispy protein-packed crust took no time at all. Also, with seasonal vegetables, I knew the nutritional value was there. And with the smell of freshness roasting away in the oven, it brought about the memories of comforting home-cooked meals I grew up eating. And boy could I go for one of those meals. Growing up, I was fortunate. It wasn’t until about the middle of college – when I needed to cook on my own – that I realized just how fortunate I was. Other coeds in my environment experienced only tv dinners throughout their childhood (it was the 80s after all), leaving them with limited taste preferences, food experiences, and nutritional prowess. While I was never deprived of the famous Kid Cuisine (anyone remember the chocolate pudding?! ), I also was scarfing down raw veggies as snacks, Cornish game hens, salads at every meal, and a variety of edible colors. Because of this, I ate. I ate well. Vividly I remember coming home from basketball practice, showering and getting to work on my homework on my mom’s old roll-top antique desk. The soft, outside ambient light was turning dark, and the house always had lingering warmth from the SoCal day. Downstairs, Tom Brokaw’s velvety voice reported the day’s happenings, and my sister was probably sitting on the step in time-out (sorry, Jenn, but you did spend a lot of time there). A pot was on the stove, or something was in the oven, and the smells were always delicious. I sat in a holey blanket struggling through my pre-calculus, a soggy messy ponytail dampening my sweatshirt, Casey the dog at my feet (before he got old and stinky), and the comfort of knowing a home-cooked dinner with my family enrobed me. The computer screen just got foggy. I miss those days. Wanting to fill the house with the smell of warmth, I knew baking or roasting something would be ideal. I roast veg a lot, but wanted to spice things up a bit and make the meal special – average weeknight special. So finding some leftover quinoa flour, I whipped up a quick dough with cold butter and cold yogurt. Free-forming the rolled out dough around some seasonal veggies held them together with a sprinkling of very sharp cheddar cheese. After 40 minutes in the oven, a beautiful, rustic galette was born. And the house smelled weeknight wonderful. Of course the circumstances were different, but when the light gets low and the house starts to smell like the love someone put into a good meal, it’s like a big, necessary hug (sans homework). To make the dough, cut the yogurt and butter into the flours with salt until the dough shows pieces the size of peas. NOTE: use a pastry cutter, or two large forks to cut the dough. Add in the cold water, a tbsp at a time, mixing until dough holds together when squeezed. On a floured surface, pour out the dough and form into a disk. Working quickly to keep the dough cold, roll out the dough with a rolling pin until it is 1/8 in thick. Using as much surface area as possible, use a paring knife to cut the dough into a large circle, discarding the few outside scraps. Roll the circle of dough over a rolling pin, and lay it onto a parchment paper-lined baking sheet. 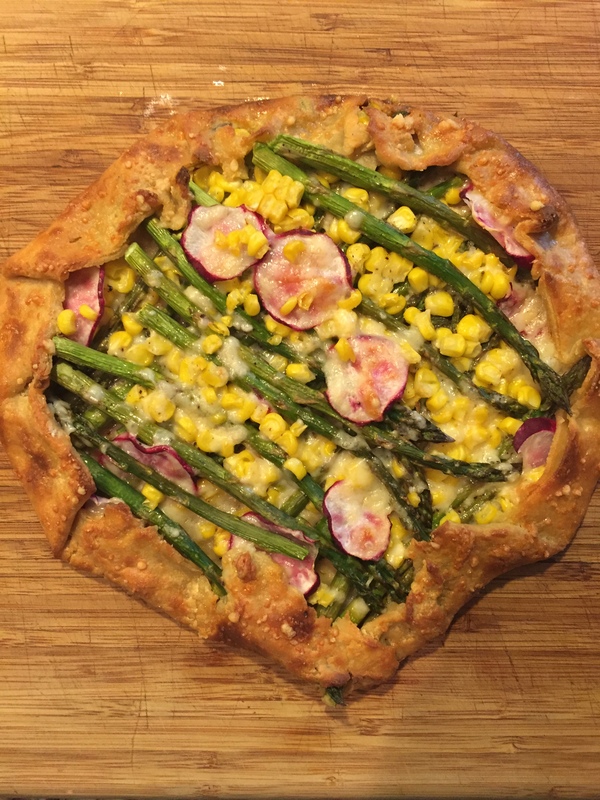 In the center of the circle, layer the asparagus (I used thinner stalks here), corn, and radishes, leaving about an inch border all the way around. Sprinkle the veg with s&p and a tbsp drizzle of olive oil. 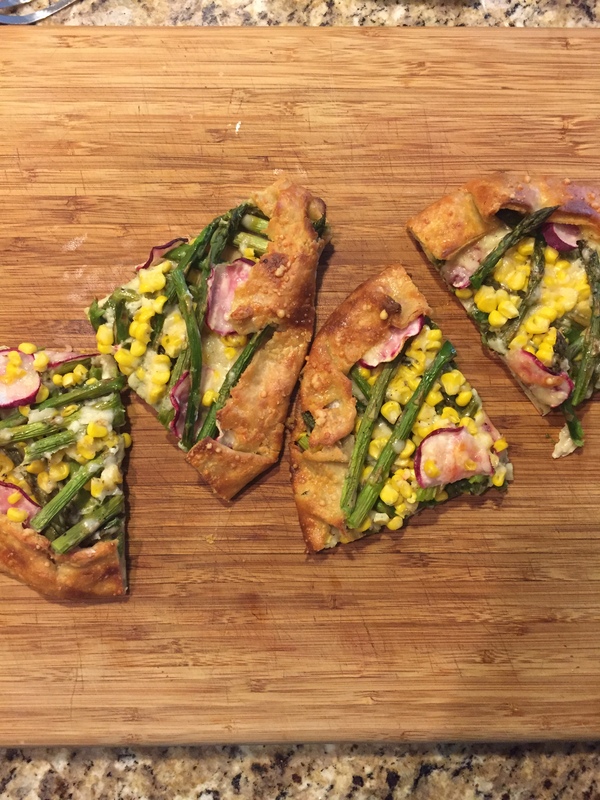 To create the galette, start with a piece of the edge and fold over the veg to create a little crust. Go all the way around folding (and crimping the pieces together if you want to), until a little open pie is formed. Sprinkle the galette with the cheddar cheese. If using the egg wash, paint the crust of the galette dough with the beaten egg (this will create a lovely golden, shiny color on the crust once baked). Put the sheet pan in the oven and bake until the crust is browned and the veg are cooked through, about 40 minutes. Slice into pie pieces, and pair with a light salad. Enjoy!